OHIO -- Police in Dayton said a dog was so seriously injured by a pack of other dogs that he could barely walk. According to witnesses, the pack of dogs went after several other animals Monday in the area near Hoover and Oakridge avenues. Investigators said children were playing just a short distance away from where the attack happened. Witnesses said even from a distance, you could tell the dog was badly injured because it was not putting any weight on its left front leg. Emergency crews said the dog’s leg was likely broken. People who were in the area, said the pack of dogs went after the animal around 10:30 a.m.
Aaron Thorpe, who was playing nearby, said he was not going to break up the attack. “I couldn’t. 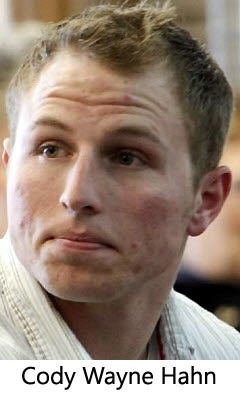 I did not want to get bit,” Thorpe said. Other people even threw cans and bottles at the dogs, hoping to save the animal’s life. Meriner said a pit bull was the one dog that attacked the animal while the other dogs in the pack watched. Witnesses said the pack left, but then the pit bull came back again. This time he was alone and went toward the injured dog again, but an officer scared the pit bull away. The Montgomery County Animal Resource Center went to get the injured dog. Officials said the German Shepherd mix is still alive. Officers said they located another dog that is believed to have been part of the pack. They said they had to use a Taser on the animal in order to get control of it. The Animal Resource Officer said they have been called to the area several times since last summer on complaints of packs of dogs. 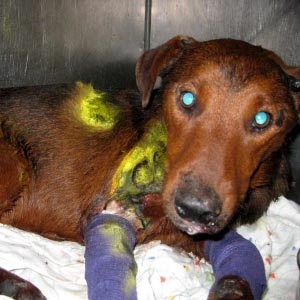 NEBRASKA -- A dog on a rampage critically injured an Omaha woman. Lorrie Ellis is now in fair condition at The Nebraska Medical Center after the Douglas County Sheriff says her son's pit bull attacked her. "The dog just attacked a lady, I can not get him off of her and there is blood everywhere," says the dog's owner's girlfriend to a 911 operator. It happened inside the 48-year-old woman's West Omaha home. The pit bull was growling at a child inside the home Sunday night. When Ellis tried to stop the dog, the he turned on her. UNITED KINGDOM -- Niamh Webster-Guy's cheek and lip were rebuilt in a three-hour operation after a bull mastiff attacked her. 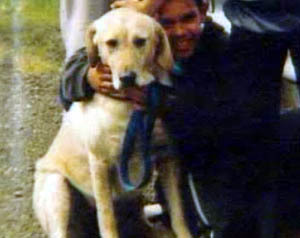 The schoolgirl was outside a house when the dog reportedly leapt onto a garden fence and jumped at the her. Niamh's mother, Cheryl Webster, said: "I was absolutely terrified - Niamh's face and lip were just hanging off. "She was on the pavement outside her friend's house when the dog came bounding out. It put its paws on the fence, then went straight for her face. "There was a big loss of blood and they had to completely reconstruct her lip - she had to have over 100 stitches. "The police spoke to the owners but, apparently, they don't want to put the dog down because they say it's never done anything like this before. "But it's vital that the dog is put down - that's what I want more than anything." Niamh, a pupil at Cotmanhay Junior School, near her home in Cotmanhay, Derbs, was waiting outside the house with a friend when she was attacked last Tuesday. She was taken to Ilkeston Community Hospital by her parents and transferred to the Queen's Medical Centre, in Nottingham, before being moved to Nottingham City Hospital. She was released three days later but Miss Webster, 39, said Niamh would not be ready to go back to school for a couple of weeks. Miss Webster said: "We've had to take her back to hospital since she left because she was bleeding through her stitches. "The injuries are, thankfully, healing well and little traits of her personality are starting to come back. "But it was a scary ordeal for her and it worries me that others may have to go though what we're going through while the dog is still around." Niamh's father, Darren Guy, 43, said: "No-one should have to go through the pain and suffering that Niamh did, or the heartache that me and Cheryl had to go through." Bull mastiffs, a cross between a mastiff and a bulldog, were originally bred to help gamekeepers against poachers. 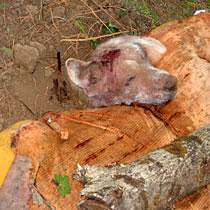 Under the 1991 Dangerous Dogs Act, various hurdles must be overcome before any prosecution can be brought. A spokeswoman for the Derbyshire Police said: "We are still making inquiries at this stage to see if any offences have been committed." OKLAHOMA -- A Sapulpa soldier at the heart of an animal-abuse case steadfastly denied ever dragging a dog behind a vehicle, and told the Tulsa World he was looking forward to proving his innocence. 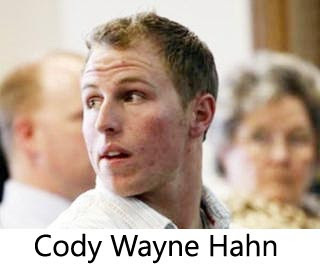 Cody Wayne Hahn, 20, appeared Wednesday before Creek County Special District Judge Richard Woolery, who set a March 11 preliminary hearing for Hahn, charged with cruelty to animals. The case against him stems from an Oct. 16 incident in which several witnesses told sheriff’s deputies they saw a dog being dragged by a sports utility vehicle along 161st Street. Deputies found the vehicle the next day and questioned Hahn, who denied any knowledge of the incident, authorities said. 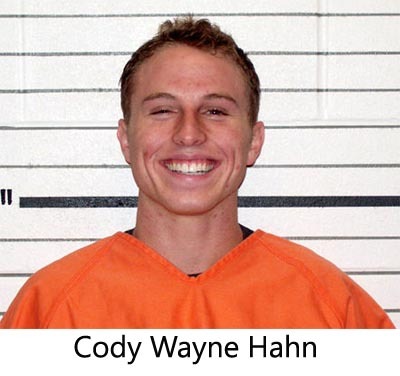 However, the Sheriff’s Office said those witnesses picked Hahn from a photo lineup as the SUV’s driver. OREGON -- In January Hyrum Long pleaded guilty to one count of first-degree animal abuse, a misdemeanor. 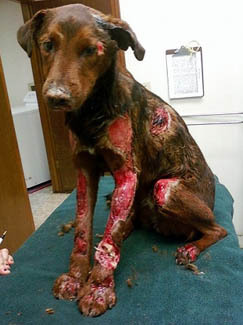 The original charges of felony aggravated animal abuse and animal abuse were amended to the single misdemeanor charge. Today Judge Rick Knapp sentenced Long to to 120 days in jail, with two years of formal probation and 100 hours of community service to follow. In addition, Long was forbidden to own, control or possess any animals. “There’s no disputing that the case, on its face, is horrific,” said Long’s defense attorney, Donald J. Watt, who explained that Long grew up at a time when pet owners euthanized their animals without veterinarians. Yeah, I guess in the old days when you had a sick dog that showed long-term malnutrition, hadn’t eaten for most of a week and had a skin disease that had went untreated for more than a year you would just bash it on the head with a hammer then bury it alive up to its neck then go out to enjoy a Chinese dinner. Hmmmm…. I never heard stories like that. His lawyer argued to have Long sentenced to only community service rather than jail time because his wife was sick. Wouldn’t someone be worried he might try to take that situation in hand….. nevermind, won’t go there. Anyway, he’s been sentenced and will do his time. Molly is in a better place now, I have to look at it like that or it will hurt too much to think of her last hours. 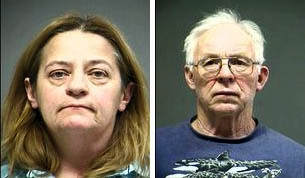 In December, Long’s daughter, Susan Johnson, pleaded guilty to one count of first-degree animal neglect before Washington County Circuit Judge Rick Knapp. She was sentenced to 90 days in jail, two years formal probation 100 hours of community service and cannot own any animals for five years.